ORONO, Maine - The University of Maine Men's Hockey team blitzed for a three goal second period to upset the No. 2/2 UMass Minutemen on Saturday night. Goaltender Jeremy Swayman kept the Black Bears locked in the contest until the very end, stopping a career high 53 saves for the victory. First Goal (1-0 Maine): From the faceoff, Patrick Shea won the puck back to Canon Pieper waiting at the high point, where he fired off an initial shot that was kicked out by Matt Murray. Emil Westerlund pounced on the rebound in the slot to score Maine's first. Second Goal (1-1 UMass): UMass jumped on the board a few minutes later in the first, as Jake Mclaughlin fired a long pass from his defensive zone to the offensive blueline, here the puck was handled by Jacob Pritchard. Pritchard cut across the slot, pitching the puck over to John Leonard, who fired in a quick wrist shot for his eighth of the year. 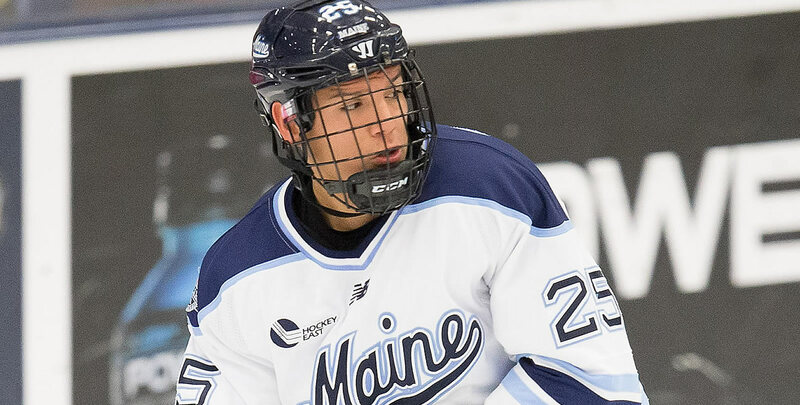 Third Goal (2-1 Maine): On a five-minute power play, Alexis Binner handled the puck at the top of the blueline, cutting across and firing a laser on goal to give Maine a lead they wouldn't relinquish. Fourth Goal (3-1 Maine): Eduards Tralmaks handled a pass from Tim Doherty behind the net, cutting up from the boards to the point before sending it over to Jakub Sirota at the top of the point. Sirota cut over to his left and passed back to Tralmaks, who sniped a shot through traffic to extend the lead. Fifth Goal (4-1 Maine): Still on the power play, Brady Keeper attempted a shot from the point that was stuffed in his feet, which he recovered and sent along to Mitchell Fossier on the nearside boards. Fossier sent over to Keeper in stride in the slot, where he fired it in over the blocker for his third of the year. Sixth Goal (4-2 UMass): On the power play, Marc Del Gaizo handled the puck along the nearside boards, rifling a pass over to Jacob Pritchard at the farside hash marks for his 12th of the year. Seventh Goal (4-3 UMass): Mitchell Chafee took the puck alone in space shorthanded, pulling back and sending in a wrist shot for his 15th of the year. - Swayman's previous high for saves in a game was 50, recorded on Dec. 8, 2017 at Quinnipiac. - Swayman stopped a John Leonard penalty shot 49 seconds into the second period, keeping the game tied 1-1. - Maine's power play went 3-for-5 on the night, posting two on an extended five minute major. - The Black Bears defense blocked 6 UMass shots.